Your Chart of Accounts (CoAs) is the baseline for the rest of the billing system. They are basically a way to track all your revenue or income categories. SwimOffice does not track account types like assets and expenses, rather it allows you to simply track how much you have billed people in various categories. It’s a simple process that allows you to get as detailed as you want. SwimOffice has several default categories that may work fine for many teams; feel free to delete and add to those defaults. If your team has complex needs you may want to work with your accountant or finance person to determine the various Chart of Accounts needed. 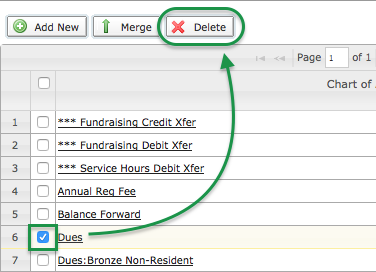 We’ll first go over the mechanics of adding, deleting and merging CoAs, and working with QuickBooks so that Accountant-types can move on, then cover things to think about when building your CoAs. 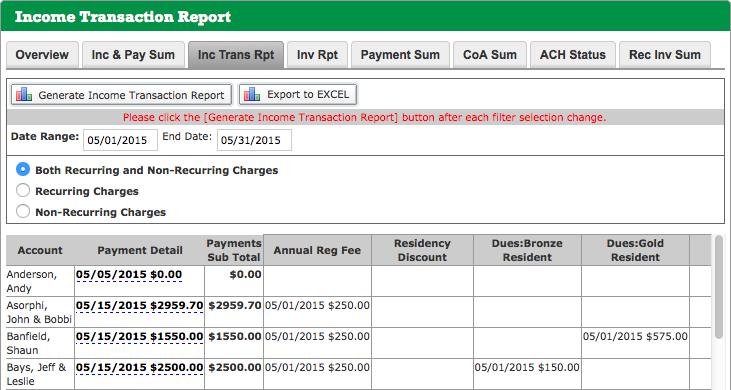 To access your Chart of Accounts, in the side navigation click Billing Admin > Billing Setup > CoA Setup tab. Click Add New, or click the name (not the checkbox) of an existing CoA to edit it. Fill in a “Chart of Account” name (pay attention to the warning if integrating with QuickBooks; see below). For “Charge Type” select Normal Charge/Discount, although you can select Donation instead if it's for a CoA to be used in TUMoney. Check the boxes by the CoA(s) you want to delete. Confirm you want to delete the CoA(s) by clicking OK. If a CoA has ever been used to create an invoice item you will never be able to delete it; this is to protect the integrity of those invoice items. However, you can merge two CoAs together. Select the CoA to be merged into another CoA (the “Merge From” dropdown). Select the CoA to “Merge To.” This will be the one remaining after the merge. Confirm you want to merge by clicking OK. Note: You CANNOT undo a CoA merge! Make absolutely sure you want to merge the two CoAs you selected. Consider periodically reviewing your CoAs. If you discover one is no longer or seldom used, you may want to merge it into a similar, more frequently used CoA. This will keep the number of CoAs down to a manageable number. If your team uses Intuit QuickBooks, SwimOffice generates an IIF file each month you can import into QB. Note it only works with the desktop version; QuickBooks Online will not import an IIF file even though it’s a QB file format. Please read the QuickBooks TeamUnify Integration Guide, which also has an accompanying video, to properly enter the Chart of Accounts used in QB into SwimOffice. This is crucial to ensure they work properly together. There are many great guides for learning about and setting up CoAs in detail, such as Bean Counter’s Chart of Accounts. Here are some basics to consider. Think about what income streams you want to track when building your CoAs. You likely won’t want just a single CoA called “Income” where all invoice items get thrown into it because you would have no idea how much money different aspects of your team are making. Nor would you want a separate meet fees CoA for every single meet you attend, although some larger teams do get that detailed. Do you want to track how much revenue each roster group generates? If not, a single “Team Dues” CoA may be enough. But if so, consider naming your CoAs “Team Dues - Gold,” “Team Dues - Silver,” or “Team Dues - Age 7-8” and so on. Since you cannot generate reports by Billing Group or Roster Group, this is how you will need to set up your CoAs if you want to track each group. This is helpful when determining the financial health of each group. Likewise, even if your prices are the same for each Billing/Roster Group, you will need a separate Billing Group for each since you will need to associate a different CoA with each one. Roster groups are not tied to finances in any way, so you will likely name your Billing Groups the same as your Roster Groups if you want to track income this way. You may need to come back to CoA Setup for modification as you add your Billing Groups and edit the Membership Dues Schedule since they all interact. 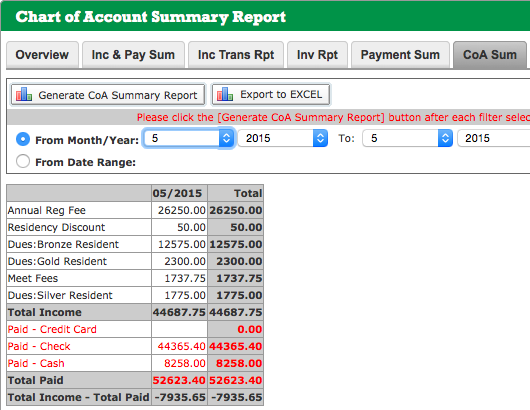 We will cover billing reports in a separate module, but here are a couple of screenshots to show how having a set of well defined CoAs enables you to track income both overall and in detail by parents’ Accounts. Now that you have set up your Chart of Accounts we will cover entering your basic billing info.